How do you know when you are going the wrong way….in life, in work, in relationships, in anything? I would simply say that most of us know when we are headed the wrong way, we just choose not to listen to our gut instinct or the still small voice in our heads. Many of know something is wrong but we would rather bury our heads in the sand so we don’t have to deal with whatever issues are before us. Many of us know changes need to be made but we are fearful of what those changes will cost us. Many of us have been given signs and in your face clues things are not as they should be but we refuse to take the steps towards making things better…..we just play pretend…UNTIL, we can’t play pretend anymore! Eventually, the things that are wrong in our life, our work, our relationships, our anything, are going to catch up with us. The things that are wrong are just not going to disappear, they will continue to reappear and reappear and reappear and then move into something worse. How do you know if you are going the wrong way? You pay attention. You look for the signs. You listen to your gut instinct and the still small voice. When you know you are headed the wrong way, start changing what you can, when you can and do what you can with what you have. 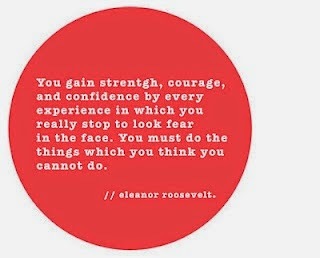 It is always better to face things head on…..face the fear, in the end you will be better for it and stronger.